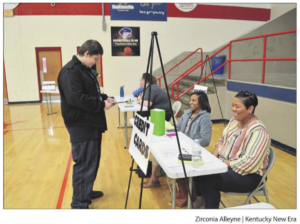 Two USB employees, LaShaa Manningand Brittany Butler, recently participated in the Reality Store at Christian County High School. LaShaa and Brittany helped students understand the process to apply for credit cards and how to use them wisely. USB will be participating in the Reality Store at Hopkinsville High School and Heritage Christian Academy as well. « Meet Loan Servicing Specialist, Valerie Powell!